I love the filigree paisley design and long length of this ring. It is like a piece of armour for your finger, a very stylish piece of armour that is ! This long length style is open at the back for added flexibility, in case you were worried about that. 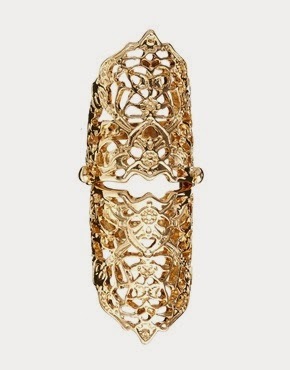 This gorgeous gold plated ring is by Etro and is available to buy now at Net-a-Porter. At only €110 this really is an affordable piece of designer costume jewellery but of course that isn't to say there isn't a Look4Less available. Not as delicate as the original I admit, but for €8 you’ll get the same stunning look without having to spend a small fortune. This is just a great Look4Less apart from the price these rings are almost identical. The ring below is from Asos and costs €8. The main difference between this and the original is the fact that the Asos ring has a hinge in the middle allowing it to bend with your finger.